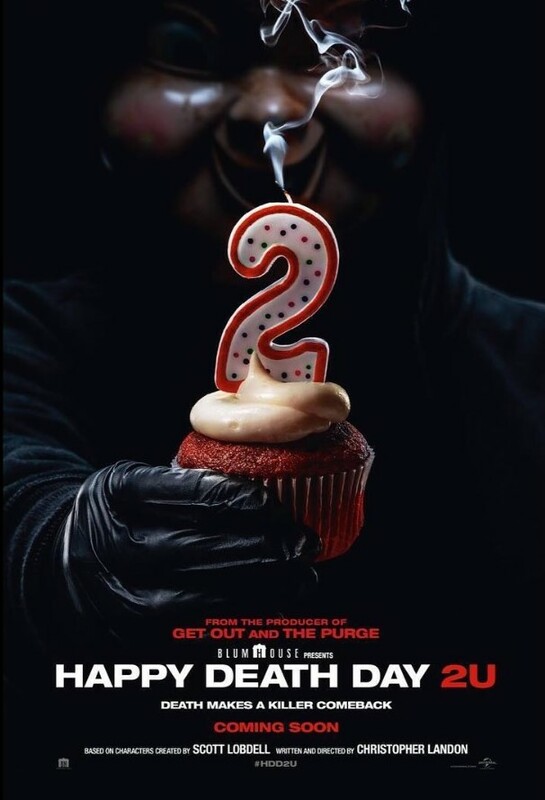 Home / MOVIE TRAILERS AND INFO / A Scary, Funny Time-Turning Adventure in "Happy Death Day 2U"
A Scary, Funny Time-Turning Adventure in "Happy Death Day 2U"
Universal Pictures’ new suspense thriller Happy Death Day 2U, the sequel to the 2017 acclaimed box-office hit Happy Death Day Equal from returning producer Jason Blum (Glass, Split, Get Out) and returning writer/director Christopher Landon, is equal parts terrifying horror, unexpected comedy and time-turning adventure. When the original Happy Death Day opened at No. 1 to more than $26 million in fall 2017, moviegoers were riveted by the idea of a heroine who had the chance to make the most of the last day of her life—reliving over and again the 24-hour period that led up to her murder. Needing no one’s permission to turn the tables on her tormenter, Tree (Jessica Rothe) would stalk the killer into submission. The film upended the classic tropes of the horror genre, and audiences went wild for the delightfully twisted tale. Drawing inspiration from such classics as Groundhog Day, director Christopher Landon—whose prior films included Paranormal Activity: The Marked Ones andScouts Guide to the Zombie Apocalypse—revealed a fascinating knack for importing inspiration from a wide range of films into the horror genre. While Tree outsmarted her own death in Happy Death Day, the sequel gave the filmmakers the opportunity to delve deeper into what was happening behind the scenes—and just out of our reach—to explain the loop and reveal more of her tumultuous past. At the beginning ofHappy Death Day 2U, we find a protagonist who has made amends, has forgiven herself and is finally happy. Still, according to Landon, once Tree realizes that she’s stuck in another type of hell, she has some big decisions to make. Jessica Rothe leads the returning cast of Happy Death Day 2U, the follow-up to Blumhouse’s (Glass, Split, Get Out, The Purgeseries) surprise 2017 hit of riveting, repeating twists and comic turns. This time, our hero Tree Gelbman (Rothe) discovers that dying over and over was surprisingly easier than the dangers that lie ahead.